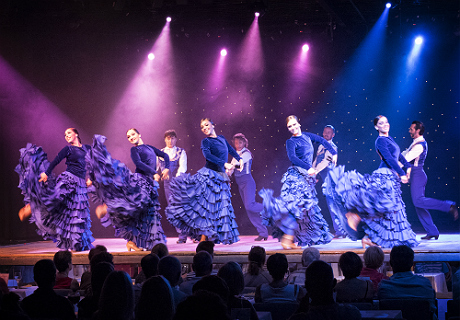 The show Suite Española is a two-part show featuring Spanish dance and flamenco. The location in Benalmádena is within the Hotel Estival Torrequebrada. Adjacent to the beach offering a warm and relaxed Mediterranean atmosphere, the venue is easily accessible from Malaga, Marbella and many of the smaller towns in the region. 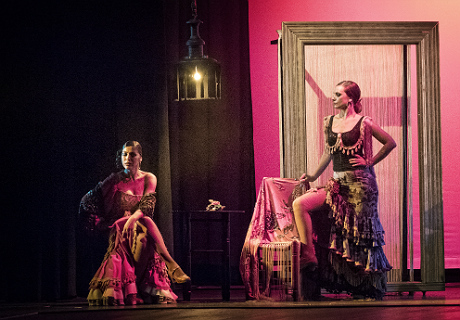 The show Danza Española "Alegría" is a powerful presentation and music as a flight over the Spanish woman and her beauty, untangling her presence, elegance and mystery. The woman gives pass to the boldness of the man with one of the most important dances. Repertoire: La Farruca del Molinero, belonging to the famous work "El Sombrero de Tres Picos" by D. Manuel de Falla. Little by little, the audience is immersed in another of the classics, interpreting the powerful dance of "La Vida Breve", from the opera of the same author. 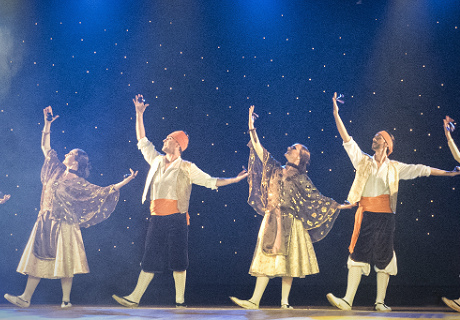 Then three dancers will masterfully interpret the repertoire of "La Danza Molinera y de Las Uvas", also belonging to Falla's "Sombrero de Tres Picos". 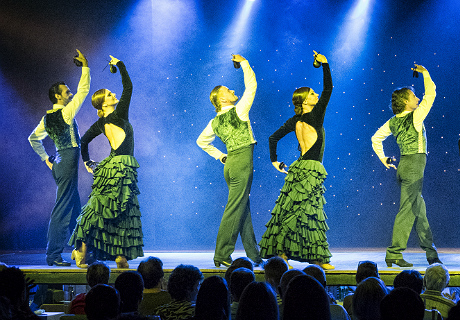 Next on stage is a tribute to the wonderful zarzuelas, an original choreography by the famous Fandango de Dña. Francisquita, belonging to the work of the same name composed by Amadeo Vives. After this number the performance moves to the intimacy of an un paso a dos inspired by the splendid voices of Rocío Jurado and El Lebrijano, belonging to the work composed by Manolo Sanlúcar, "Ven y sígueme". A passage to Aragon marks the conclusion, with the very powerful Jota "La Dolores" composed by Tomás Bretón and belonging to the zarzuela of the same name. 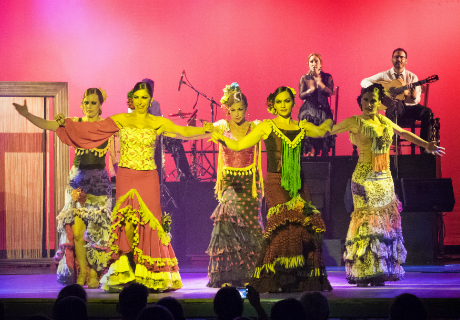 The show "Chinitas" is an homage to one of the most influential cafes-cantante in Malaga and maybe all of Spain. The famous Café de Chinitas in Malaga was a popular meeting place for actors and writers as well as flamenco perfomers. 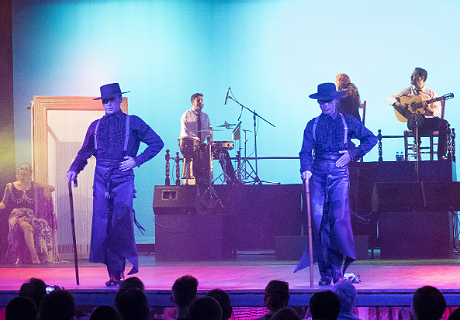 Visitors from around the world came to the Café de Chinitas, attracted by this atmosphere and the flamenco artists who performed on the stage. Some of the great figures of the day were featured such as Juan Breva, Antonio Chacón, La Macarena, La Juana, La Trini, Torralba, Isabelita Ruiz, Luisa Albéniz, Manuel Torres, Juanito Valderrama Pastora and Tomás Pavón, Manolo Caracol, Cojo de Málaga, Palanca, Marchena and Juanito Valderrama amongst others. Afterwards guests who have attended the show can enjoy free entrance in the nearby casino after 24:00 (only adults over 18 years) with valid ID and proper attire required for entry.